But No Longer Shall I Be Wanting and Empty of the Void That Print Hath Left Behind! 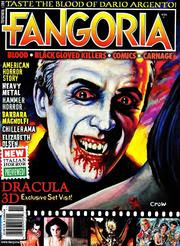 As the Classic Horror Magazine FANGORIA RETURNS! (GASP).... Yes, you heard right. The grapevine was amuck with some of the whisperings of that magazine coming back in 2017, alas with no confirmation whatsoever. Until now, of course. A press release was sent confirming the truth: FANGORIA will return in the Fall of 2018. Rather fitting. The date will be right around Halloween, in fact. There needs to be a Fangoria. The magazine was a constant presence in the genre since 1979 - and then one day it was gone. That felt, to us, tragically incorrect. Fango was, for multiple generations, a privileged window into the world of horror. It gave us access to filmmakers’ processes and secrets, opened our eyes to movies we might have otherwise missed, and nurtured a wave of talent that’s out there driving the genre today. I’m proud and excited to be part of the team that’s bringing this institution back. When I read Fangoria as a kid, it was a special ritual. I had to save up for it, and then I had to find it. And bringing it home ten times a year became a kind of sacrament, poring over every photograph on every page, reading that whole thing front to back, then doing it again. We want to restore that analog thrill to readers. We want to duplicate the excitement that I remember bubbling up around a new issue of Fango, put that excitement in an envelope and mail it to our subscribers. Fangoria is not something that competes with online blogs. Fangoria is not an algorithm. Fangoria is something you hold in your hands, something you spend a bit of time with in the real world. That’s what it was for decades, and that’s what we’re going to make it again. I call that pretty definitive. So How Did All of This Happen, You Ask? It turns out that Cinestate, a Texas-based entertainment brand, sealed the deal, acquiring all assets and trademarks of Fangoria. That included the magazine itself. The original owner of the brand was The Brooklyn Company. It took some courting to make it happen; but after several months, it was official: Cinestate and CEO Dallas Sonnier officially owned the Fangoria brand. Dallas then hired Phil Noble Jr., a writer best known for his work on the website Birth.Movies.Death as well as a writer/producer for Stage 3 Productions. It was where the man created a feature-length documentary on Carpenter's classic HALLOWEEN. So you know the guy's got the goods when it comes to the horror genre. FANGORIA will approach even more than just the gloss of a newly printed magazine. Cinestate will, in fact, start producing films, podcasts, and even novels in the Fangoria name! Yes, it's true: time to celebrate. Print's back. Specifically for the horror genre. And that, my friends, is a beautiful thing.